Villa Velure is beautifully situated near Castelo Beach in the sun-drenched Algarve, Southern Portugal. In this peaceful location you can enjoy the privacy of your own secluded swimming pool and the relaxing ambience of this large characteristic child friendly villa. Use of the games court is exclusively for guests of Villa Velure and kids love it. From the terraces and the 2 upstairs balconies, there are panoramic views of the rugged Algarvian hills,Monchique Mountain and the ocean. Although the villa is in a quiet cul-de-sac,with plenty of greenery around including some majestic trees,everything is at your finger tips: beaches,good selection of restaurants,bars including 1 disco bar, tapas bar, minimarket and supermarket,bus stop,hairdresser and beauty salon, beach/pool accessories and souvenir/gift shop, tourist info, golf and car rental office, taxi rank, are all within walking distance. Airport transfers and local transport available at reasonable prices.Car hire recommended, not necessary. A huge 400 square foot (37 square meter) lounge with air-con, beautiful marble fire-place, housing a wood-burning stove, Sky TV, DVD, Sound Centre. Comfortable seating for 10. French doors leading to south-facing leisure area. Board games to keep children and adults engaged! Large garden with private games court! Notes on accommodation: For baby comfort, there are 2 cots (inc bedding), 2 high chairs, stairgate, babymonitor, etc. Both upstairs bedrooms have large balconies with stunning views and both downstairs bedrooms have French doors onto terraces. Lounge: Beautiful free-flow, airy and bright lounge with walkout doors to great outdoor living space with patio, pool, bbq and games area Outside: The gardens are mature and colourful with a well furnished leisure area ( 12 loungers, 5 tables and 12 chairs ), including a typical Algarvian barbecue and a games court (Badminton, Basketball, Volleyball, etc.). Badminton rackets and shuttlecocks are provided. The pool and the games court are for the sole use of Villa Velure guests. Cleaning / Towels / Linen / Maid service: Towels and linen are provided (excluding beach towels). Full clean and housekeeping once a week with mid-week Towel change as required. Security alarm and safe. I think it’s unfair to let this put you off as the condition has just been inherited by the new owners and think if they Refurb the villa then it would be absolutely stunning. I will say that when we reported a problem, it was dealt with by the new owners straight away. Sorry about the glitches you faced with the water and alarm etc... thank you for your feedback and we understand your sentiments. It is indeed a lovely house and great location but needs some updating - we have extensive refurb plans scheduled early 2019 (had to wait to get all this done, off season)... and it would be our pleasure to host you in the new and improved villa any time you are back in the Algarve. Once the refurb is complete, we will send you pictures besides of course updating these on the website. Outside space and poolside area were lovely but the villa itself is in need of refurbishment. All the bathrooms and the kitchen require modernisation. The tiled areas are so old (eg the showers) that they obviously can not be properly cleaned. The dishwasher was very rusty and the oven had to be lit with a match (none were supplied). We were requested to use calgon tablets in the washing machine and were told these would be supplied but they were not. There were no dishwasher tablets, salt or rinse aid. There were no roasting dishes and very little in the way of cooking equipment. The bedding was not changed as promised and the towel change was so late in our 10 day stay that we had to wash all the towels ourselves. The cleaning was fairly minimal. Although the rooms were large enough for our needs we felt that with a bit of TLC the villa would have been ideal . We found all the local restaurants to be of a very high standard and all within easy walking distance. We would not at this stage recommend the villa to other parties but feel that if some refurbishments were to be carried out, particularly to the bathrooms it could be a very nice place to stay. We appreciate your honest review and sorry that there were issues with the housekeeping. We will immediately get with the management company that we have contracted for these services to fix service standards asap. We sincerely apologise for this inconvenience. You are aware from our Guest Welcome Letter that we have recently bought the property along with the bookings for 2018. The previous owners did a great job with the property in their time and continue supporting us through the transition. We totally agree with you that it is indeed a beautiful villa in a fantastic location, however in need of some updating and upgrading while we retain its character and charm. We have an extensive refurb plan and plenty of lovely ideas to improve and upgrade the villa to make it more modern and comfortable (incl aircon in all the bedrooms) as well as work on the kitchen and bathrooms... we intend to get started on this at the end of this season and are already discussing plans and priorities for this project. Brilliant villa. Very spacious inside and out. Had a fantastic week . Villa clean and very spacious. Plenty of outdoor space. Pool nice and clean. Delighted you enjoyed your time at the villa. Thank you for your appreciation! It really is a comfortable home-away-from-home. 5 adults and 2 children at no point did we feel we were falling over each other as so spacious. Well equipped with everything needed to create a home from home. Lovely gesture of a starter pack, milk, bread, butter etc. Great sized house with reasonable sized pool - everything you need is there in the house with absolutely loads of cutlery plates glasses etc plus many other extra little touches. Very large plot around the house so plenty of room - we were 8 plus a baby and never felt cramped in the house or outside. Loved the area too with a few good restaurants and bars in walking distance - recommend Angie's for good prices and great simple menu choices and lovely cocktails and staff. Tapas at O amigos was great too both times we went - ribs in particular went down well! My only downside was the air con. There's only one unit in the living room and it didn't get anywhere near the bedrooms so it was too hot for us. If there was more air con it would've been absolutely perfect. 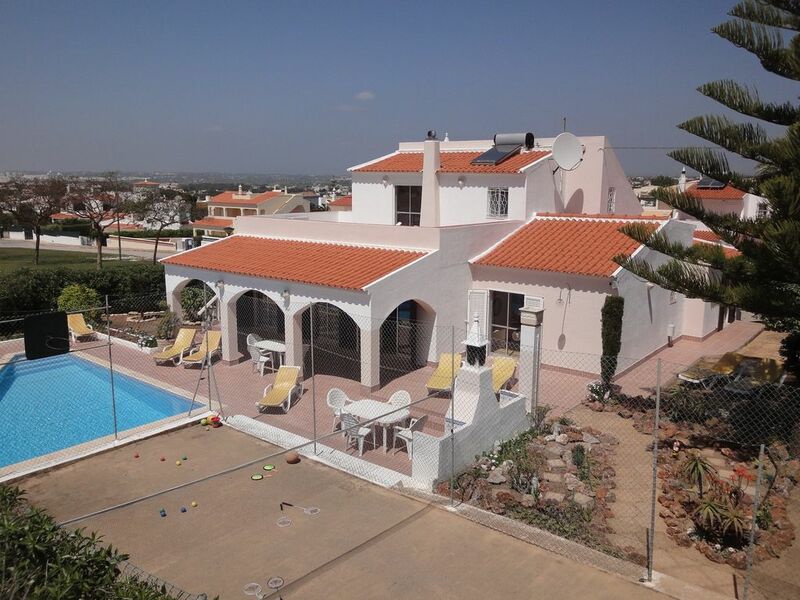 Faro,nearest airport approx 35mn drive.Villa GPS N.37/04/923 W.008/18/008.Airport transfers by minibus and local transport available at reasonable prices,operate from just round the corner from the villa.For car hire,we can recommend a family-run Portuguese business that we have used for the past 26 years. Local taxis and 'Come & Go' bus stop to Albufeira also nearby (time table and tel nos in the 'welcome book').The 3 bus stations are a short taxi drive,between 5 & 8€ .Train station approx 10€. Good selection of restaurants within walking distance,cheap & cheerful typical Portuguese,Italian,Indian,3*& 4*,& Michelin *:Vila Joya(approx 1km). No shortage of bars(nearest a mere 120m) & 1 disco bar. Hypermarket with a myriad of shops + 9 cinemas and food hall, 10mn drive. Minimarket approx 300m. Supermarket approx 800m. Free Wi-Fi. Golf 2.3 miles (3.7kms) Zoomarine:10mn drive,Waterslide:15mn drive (curtesy bus available). Old Albufeira centre & local market:5mn drive.